My freezer is overflowing! If you follow me on Snapchat or Instagram, you saw for yourself. Seriously, stuff was falling out every single time I opened the door. Every. Single. Time. I decided to take everything out and re-organize in hopes that this would help. And it did – somewhat – but it’s still really, really full. I first told myself I couldn’t go to the grocery store at all until I had eaten down “my stash” to a reasonable amount. Then I decided I would have to buy a few fresh fruits and vegetables, but nothing for the freezer (and diet coke…you know, just essentials 😉 ). I found this roast as I was reorganizing/cleaning out my freezer and decided to try cooking it in my new Instant Pot. I bought an Instant Pot on sale after Thanksgiving. I used it once or twice and it’s been sitting on my counter ever since. A roast seemed like the perfect beginner-instant pot-recipe…and it was! It turned out great! I loved the balsamic flavor with the beef. 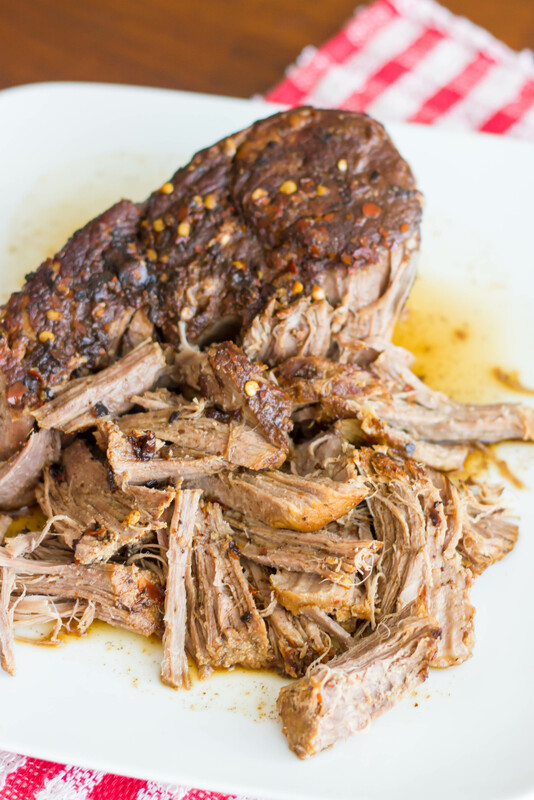 It’s a lighter, fresher flavor than your typical roast, and the sauce is soo good! Give it a try! Don’t worry though, if you don’t have an instant pot, I have included slow cooker instructions too. Enjoy! 1. Place olive oil in bottom of instant pot and turn on to saute mode. Season the roast with salt, garlic powder and red pepper flakes. 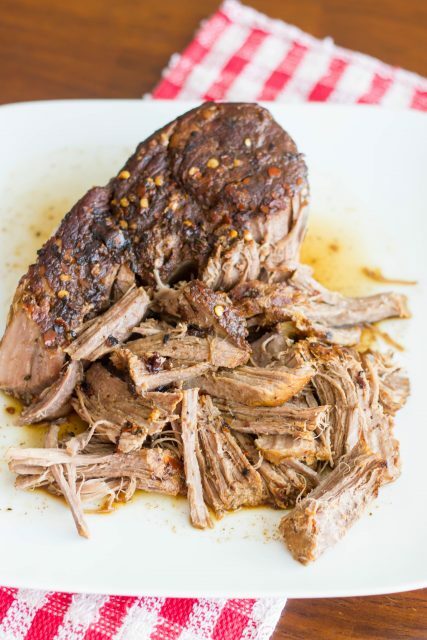 Place roast in bottom of instant pot and brown on all sides. 2. Mix together the broth, vinegar, honey, and worchestershire sauce and pour it over the roast. Change instant pot to manual mode and set for 60 minutes. Once the timer goes off, you can use natural release or manual release. Remove the roast, leaving the balsamic mixture in the bottom. 3. Turn the instant pot back to saute mode and let the balsamic mixture reduce by about half. Shred the roast with two forks. Pour reduced mixture over shredded meat. Crock-pot instructions: Heat oil in large skillet and brown seasoned roast on all sides. Remove from skillet and place in crock pot. Pour broth, vinegar, honey, and worchestershire mixture over roast. Cover and cook on low for 6-8 hours or until tender. Once tender, remove the roast. Transfer the balsamic mixture to small saucepan and cook over medium high heat until reduced by half. Shred and serve as above. All hail the instant pot! I mean seriously, this roast? With THAT much effort!? I feel like we’ve entered the Wonderful Wizarding World of cooking or something! LOVE this recipe! I know, right?? So little effort, so much flavor! Thanks Karly =). Why don’t you have a place for printing this recipe. It sounds delicious. I will work on that! Thanks for stopping by! Most recipes call for at least a cup of liquid in the Instant Pot. Will this be enough so it doesn’t burn?